Only later I came to know that the name “Snake Boat Race” comes with the shape of the boats which are used during the race and the actual name is the Nehru Trophy boat race. One of the most famous local events which attracts the people from all over the world to witness it. 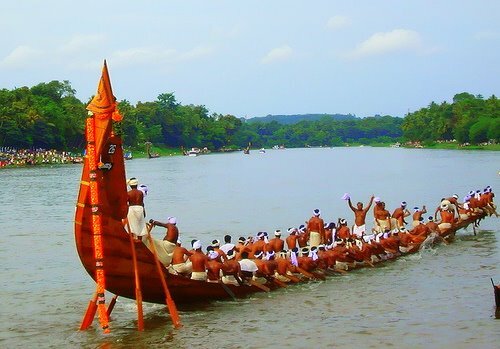 These boat races are the part of Kerala culture. 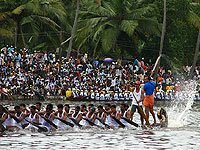 For any good event, for any religious event a boat race is organized in this area of Kerala. The Nehru troph y has a different story behind it though. As it was the tradition of the Keralites, they had welcomed the first prime minister of India, Pandit Jawaharlal Nehru, on his visit to Kerala. It was his first visit way back in 1952. Pandit Nehru was so thrilled with the performance of the rowers and the whole excitement that it created, that he declared a rolling trophy for the winner, and since then this event is being held annually with the trophy named after the prime minister. It is said that long back the ruler of the area developed these boats so that his warriors had an easy time navigating in between the back waters during the wars. The boats did help. Since then every pious event or any celebration was commemorated with a game using these boats which e ventually culminated into races. The locales call it the Vallam kali in native language, meaning the boat game. The boats are made up of Anjali thadi, a local forest wood. Today every village that participates in the race has its own prized boat and it is taken care of very devoutly. The boats are cleaned and rubbed and scrubbed. Then they are coated with oil and eggs for a smooth sail in the waters. The rowers of the boat are heroes of the village, and if they are the winners then they are worshipped! These races are normally held in the area of Allapuzhha, in the Punnamada lakes or the back waters of Allapuzhha and are held between the months of July to September. Allapuzhha or Alleppey as it is known, is an hours distance from the commercial capital of Kerala, Kochi and about three hours from the beautiful Kumarakom. The snake boat race has many records to its credit. • It is a sport event having the highest number of team members in a single team. • It is the biggest water vessel used for sports purpose. The 100-120 feet long canoes is manned by four helmsmen, 25 cheerers /singers and 100-125 oarsmen, who row in unison to the fast rhythm of `vanchipattu'or boatmen's song. The boat moves like a snake through the channels and definitely is an eye catching sight for any tourist. Every year lots of tourists throng the place to view this exciting event and also see the beauty of the state along with it. This year the boat race happens on 08th of August 2009. 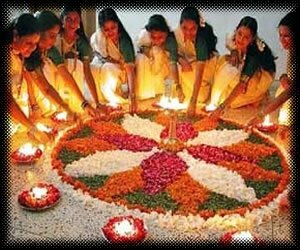 There are many packages that one can choose from to witness this event and add on the visit to rest of the Kerala. So for a cultural and festive thrill one should definitely experience this Boat race.